Scientists from Far Eastern Federal University developed a new synthetic derivative of fascaplysin – a biologically active substance with antitumoral properties obtained from sea sponges. Biological tests have shown that the compound is 2-3 times more active than fascaplysin. The results of the study were published in the well-known scientific journal Tetrahedron Letters. The work has been carried out by the staff of the department of organic chemistry, School of Natural Sciences (SNS), FEFU at the laboratory for the synthesis of natural products. 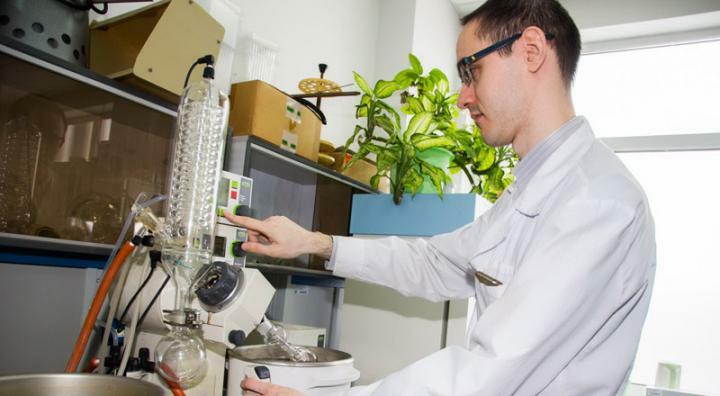 According to the assistant professor of the department Maksim Zhidkov, scientists from the university have been involved in the synthesis of biologically active substances for over 20 years. The results of recent studies are several new derivatives of fascaplysin that are promising for studying antitumoral properties in cell cultures. "Fascaplysin is a unique compound. The wide range of its biological properties includes the ability to selectively inhibit cycle-dependent kinase 4 (CDK 4) that is responsible for quick and uncontrollable mitosis of cancer cells. We tested the new derivative on the cells of cervical cancer and monocytic leukemia, and the results showed 2-3 times higher activity than in the initial fascaplysin," explained Maksim Zhidkov. According to the scientist, the study also included the development of another alkaloid that is relative to fascaplysin – 6-oxofascaplysin. This compound was obtained for the first time from the well-known dye – indigo. "Currently we are working on a method for obtaining a wide range of fascaplysin derivatives of the new type using computer modeling and molecular docking. Our calculations have shown that such a range is likely to contain promising candidates with an expressed antitumoral and analgetic effects," added Maksim Zhidkov. The research has been carried out with the support of a grand from FEFU Fund and in collaboration with other schools of the university, as well as the Far Eastern Department of the Russian Academy of Sciences. Namely, the laboratory for molecular and cellular neurobiology of the School of Biomedicine studies the influence of fascaplysin and its derivatives on the cells of glioblastoma (brain cancer). Among the participants of the research are associate professors of the department of organic chemistry, SNS, Maksim Zhidkov and Alexander Andin, as well as the postgraduate of the school Alexey Kantemirov.